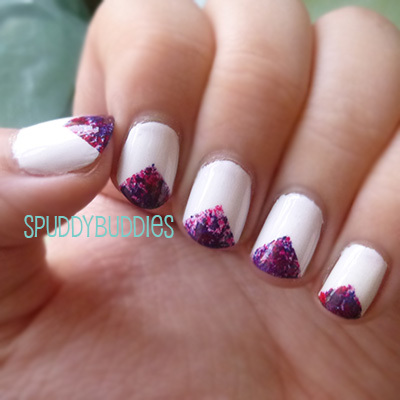 Today's nail art is simple and what I like to call: what would have been my 4th of July nails. I must have seen this design on Pinterest - can't really remember where the inspiration came from - but I started out wearing the nails plain. 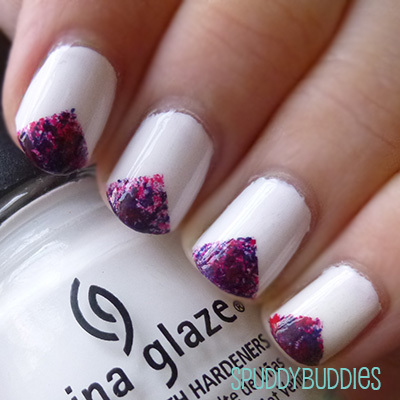 I started out with China Glaze - White on White as my base - I'm really starting to embrace white nails because they're so summery and gorgeous - and then as the tips wore off, I decided that I would sponge on some color so that I could wear the white polish for a little longer. 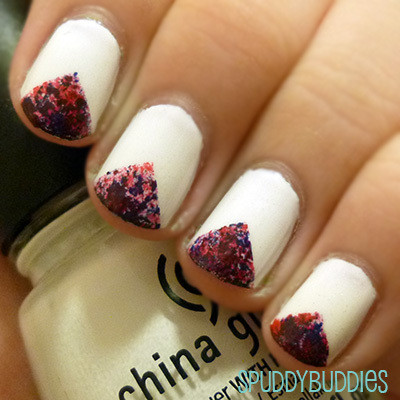 I got some of my handy tape, cut out two pieces, joined them to form a V shape, stuck it carefully on my nail and sponged on China Glaze - Salsa. I used a makeup sponge and lightly dabbed it on, leaving some white polish visible. 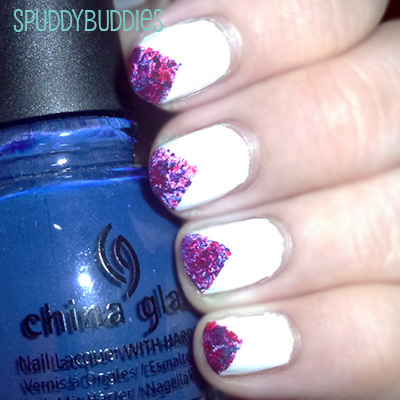 Then I sponged on China Glaze - First Mate, again making sure that I did it lightly so that I didn't cover the red and white polish. Then I peeled off the tape, sealed the design with Seche Vite and admired my nails for a good five minutes. I really like how these nails turned out. It was fairly simple to do except for the taping part which I am usually quite clumsy with. I like how the red and blue polish blended a little to create some purple-ness. Thanks for the BlogLovin follow, I am a new follower of yours too. I'd love it if you linked up to my weekly BlogLovin Hop (http://www.journeysofthezoo.com/search/label/BlogLovin%20Hop). Hope to see you every Thursday. Haha I have to agree that glitter just makes everything look so fun! Purple is one of my favorite colors too! Hey there! Just stopping by to say thanks a bunch for the follow on Bloglovin'! I'm happy to be following you back :o) Hope you had a wonderful weekend!